As consistent as they are in brewing great beer, Schlafly Beer is consistent in upsetting me sometimes. My disappointment is based solely on my own selfishness and my desire to drink certain beers 365 days a year. See, I’ve been begging – no demanding – that Schlafly make some specific brews part of their year-round menu, but sadly my demands have not become reality. Don’t get me wrong, I love that I can get a White Lager, and an Oatmeal Stout anytime, but why can’t I get the dreamy Pineapple IPA, or the Tasmanian IPA. Perhaps someday. But, enough complaining. There is good news to report, as Tasmanian IS BACK, for a limited release, and with a new look. TIPA returns to the market next week in 4-packs of 16-ounce cans. The new format will extend to all of Schlafly’s Hop Allocation beers, a series of hop-forward beers released throughout 2019. Schlafly’s designer Sarah Frost created the new look for the Hop Allocation cans. The design inspiration carries forward elements of the Hop Allocation’s design with a muted, craft feel, bright colors, and signature hop cone on each pack. It also keeps consistent with the Schlafly brand’s clean look and additional can line-up. This release follows Schlafly’s steady addition to its can lineup this year, including 12-packs of 16-ounce White Lager, Hoppy Wheat, and Oktoberfest cans, as well as canned Proper Cider: Raspberry. 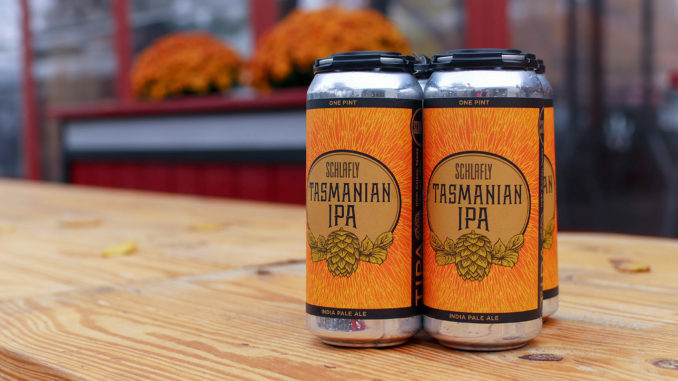 Tasmanian IPA will be available for $10.99 in four-packs of 16-ounce cans across Schlafly Beer’s distribution.